This is part of a series of collaborations between film guru Andrew Link of Windy City Gridiron and stats guy Johnathan Wood of DaBearsBlog. We’re excited to be working together to bring fans of both sites great content by combining our approaches. Last time, we identified deep passes as the main thing Mitchell Trubisky struggled with in 2018, and broke down film to see why that happened. Despite making up less than 25% of his pass attempts, 75% of Trubisky’s interceptions came on deep balls, and his completion percentage on those throws was well below the league average as he missed a lot of open targets. This week, we want to again use stats and film to see why that may or may not improve going forward. I looked at 19 quarterbacks who were starters in 2018 and had been playing consistently for at least 4 years (full data here). I’ll note that data for deep passes only goes back through 2008, so that’s as far back as I was able to go for QBs who have played longer than that. Here’s what I found: while some quarterbacks are certainly better deep passers than others, the amount of year-to-year variability for each quarterback is greater for deep passes than short passes. That can be measured through the standard deviation for each quarterback, which expresses how much they vary from year to year in a given statistic (bigger number = more fluctuation). I found this for each quarterback for the main passing statistics, both short and deep, and then averaged them for all 19 quarterbacks in each category. The results can be seen in the table below. Pay particular attention to the ratio. That’s a rough measure of how much more variable deep passing statistics are to short ones for a given quarterback from year to year. 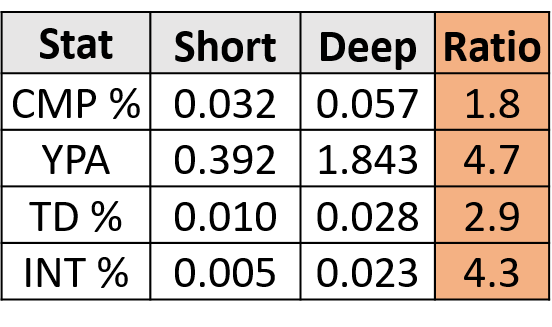 Yards per attempt and interception percentage are both more than 4 times as variable for deep passes as short ones. That’s logical, given the smaller sample sizes. The average QB throws just under 20% of their passes more than 15 yards past the line of scrimmage. It’s also excellent news for Bears fans, given Mitchell Trubisky’s high interception rate on deep passes in 2018. Since deep passing performance is variable, it makes sense to reason that Trubisky is due for some positive regression in that area next year. To flesh that hypothesis out a bit more, I looked at seasons where quarterbacks struggled with the deep ball, and how they were followed up. Also, don’t think that Trubisky having a bad year here in 2018 means he’ll be a bust. Aaron Rodgers (2x), Tom Brady (3x), and Drew Brees, just to name a few, have all had seasons like this too. I’m not saying here that Trubisky will be as good as those players, simply that having one bad year throwing the ball deep doesn’t mean you will be bad. And again, don’t think that all the QBs in this category are bad. Notable names include Aaron Rodgers, Drew Brees (2x), Andrew Luck, Matt Ryan (2x), and Ben Roethlisberger. Again, I’m not saying Trubisky will be that good, but simply that having one bad year here doesn’t mean you’re a bad quarterback. And again, some solid QBs are on this list, including Andrew Luck, Matt Ryan, and Matthew Stafford (2x). You can’t say conclusively that Trubisky is going to have a better year throwing it deep in 2019 than he did in 2018, but it sure seems like some regression towards the mean is likely. And it’s also worth noting that Trubisky’s deep ball was actually pretty solid his rookie year, when he completed 44.1% of his deep passes and only had 3.4% of them intercepted, both of which were better than the 2018 NFL average. One final stats note: Trubisky threw it deep a lot in 2018. 23.3% of his passes went 15+ yards past the line of scrimmage. For some context, only 10 of the 155 QB seasons I looked up topped 23%, and only 1 of 19 QBs – Jameis Winston – topped 21% for their career. The average season I looked up featured a deep pass on 18.5% of throws, about 5% less than what Trubisky did in 2018. This would mean 1-2 fewer deep shots a game. Given his effectiveness on short passes, which is more sustainable from year-to-year, it might be wise for Trubisky to dial back the deep throws a smidge in 2019. Stay tuned tomorrow, when Andrew Link of Windy City Gridiron will look to the film to see instances where Trubisky has flashed the ability to be an accurate deep passer, and how he can develop to do that a little more consistently.